You don’t need to quit smoking alone. Acupuncture can help reduce cravings and urges to smoke. Quitting cold turkey can be a difficult process and a step by step approach may increase your chances of success. 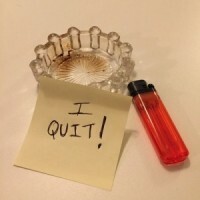 Using the NADA Protocol in acupuncture, we can help you quit smoking. The NADA protocol was originally developed by South Bronx’s Lincoln Recovery Center in 1974 to help people overcome drug addiction. It consists of five acupuncture points in each ear. This protocol is currently being used nationally and internationally to help fight addictions. We at Petson Chan Acupuncture can administer the NADA protocol for smoking cessation without having to do the usual office consultation. You just come in, have the protocol performed, rest, and go back to your daily routine in 30 minutes! It is suggested that you complete a course of 2-3 treatments a week for 4-5 weeks to have optimal results. Results will vary depending on the individual’s smoking habits. After you achieve the “non-smoker” status, it is advisable to receive maintenance treatments to help maintain a smoke free lifestyle. Give us a call or email us if you have any questions! You can read more about the NADA protocol by visiting the National Acupuncture Detoxification Association website. Remember, you don’t have to quit alone! Book an appointment online today!